The Berkline 45032 Academy home theater seating was designed with your comfort in mind every step of the way. This small scale theater seating is meant to give the user a true cinematic experience. All you need is the movie and popcorn and you are all set. The seat is designed on a smaller scale like the Berkline Tangiers and works where space is at a premium. The major difference to the Tangiers being the fact that one can custom order the seats in many materials and colors and, the inclusion of ambient base lighting and lighted cup holders. The lighting gives the home theater room a true theater appearance and on this model the lights are controlled from the inside arm. Lighted cup holders can only be included on the power version of the seat. A major styling difference is the chaise style foot rest - the most popular type for theater seating. 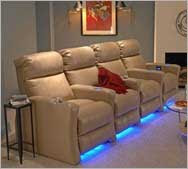 Chaise style is when there is no gap between the seat and the foot rest. This provides continuous leg support. Another styling difference is the lower seat back panel, which is solid in the Academy and split into two panels in the Tangiers. For blogging, wouldn't that be perfect!